Center-stage is a series of articles spotlighting a particular model or unit in Godslayer. This article takes a look at the first Mortan warlord of the Legions subfaction – the Centurion. As hard as nails and accustomed to the privations of campaigning, Centurions represent the ultimate combat officer. Centurions are mid-ranking officers of the legions, each commanding a hundred legionnaires. Every one is a veteran of several campaigns and an outstanding fighter, possessing a commanding presence. Just as the legions are the backbone of the empire, so the Centurions are the backbone of the legions, and it is upon their shoulders that the empire rests. Centurions are responsible for punishing offenders, managing the arrangement of camp and coordinating the logistical supplies and pay for their men. Another important duty is ensuring the proper offerings are made to the legion’s predecessors – those previous generations who fought beneath the same standard. Centurions are tasked with leading important missions, such as patrols of disputed borders; escorting important officials; conducting reconnaissance of enemy territory; leading re-supply expeditions; commanding outpost garrisons; carrying out raids; supporting tax collectors; and couriering military intelligence. Due to their position of trust they are the ideal choice for delicate missions such as capturing enemy leaders, tracking and executing rebels, sabotaging enemy resources and clandestine pogroms of recalcitrant civilians. Centurions will do anything necessary to assure the continued might of the empire, and it is unwise to cross one, for their skill is surpassed only by their zeal. The Centurion has a small base, so he is sight-value 1. Significantly, the Centurion is heavy infantry, which gives him an exhaustion limit of three (meaning he can only move 3 times per turn). DEF 12 – very poor, but this reflects the fact that he relies on heavy armor, and is also mitigated by the shield items which he can be equipped with, so it’s not as bad as it first looks. From the stats on the profile card he looks pretty unimpressive at first glance, but this is without his shield, which can add +3 statistic points, even before armor items. Disciplined – This is his sub-faction ability. Gives +1 LEAD for lead based tests. Because he has Hardened Will, he will rarely need to make a LEAD-based test; most probably against the Reek tactic of some models in order to attack them. This sub-faction ability benefits troops much more than the Centurion. With it he has LEAD 11, and that is particularly useful for his enemy tactic Counteract. In addition, legion subfaction models do never have to test for his tactics. Centuria Commander – Centurions drill their troops regularly to hear and execute their orders. This ability allows the Centurion to order tactic up to 20 inches away, making him a very strategically useful model. Close Quarter fighter – The Centurion excels in up-close combat during the crush of battle. The Centurion spends 1 less ACT on attacks when he is in base-contact with them. This is a fantastic ability, allowing him to potentially make 6+ attacks per turn. Disarm – Such veterans are skilled in tricks like knocking opponents’ weapons out of their hands. When the Centurion causes damage on an enemy, their next attack costs an additional ACT to perform. This is very useful when fighting warlords or elite models. Ancestral Pride – The Centurion calls upon the souls of earlier generations of the legion to witness their struggle, inspiring his troops to greater deeds. +1 to melee or damage rolls. This is extremely useful for increasing the POW of Legionnaire attacks. Significantly, it also applies during counter-attacks, whereas fighting-style bonuses do not. Coordinated Charge – Such veterans are experts in assessing distances and speeds under the pressure of battle. A friendly unit can measure its charge range all around it. In this way it can be really sure if it will make it into engagement or not. That’s certainly useful considering their charge range is only the usual 8 inches. It is also useful for other nearby models in your warband – measure from one unit, and you can then have a more accurate estimation for the distance from your other models. This can be useful also for a spellcaster who you consider using to cast a spell on the enemy unit. So this has some sneaky uses beyond the obvious. Counteract – Through training the Centurion has learned how to counteract the tactics of enemies. This is an “enemy tactic” which denies other units/models from receiving new tactics. It does not affect existing tactics. In order to succeed with an enemy tactic, you need to roll 1D6 plus LEAD against the same from the target. Due to his sub faction ability the Centurion has an effective LEAD of 11, and he win’s ties, so there is a great chance even against high LEAD models like the Demarchon. Against higher-LEAD enemies it makes little sense to try it. This tactic is quite significant because it can prevent a unit being buffed by its own tactics and ordered tactics. For example, use this on Hill Ogres and prevent them using Circular Slash and receiving Grace of Achallon from the Demarchon. That could save a unit of Legionnaires from total wipe-out. So far he looks like a pretty tactical warlord, (useful for buffing his warband), with two nice personal rules (Disarm and Close Quarter Fighter). Where we start to see the Centurion shine is the cool equipment he can take. The Centurion is entitled to take one sword, one large shield, one armor item and one potion. Gladius – the regular item with RNG1 and POW3. This is fine if you plan to use your Centurion as a strategic buffing-warlord, but POW3 is too weak to use him as a melee focused warlord. Executioners Blade – Allows the wielder to increase the POW by +2 for every ACT spent. So combined with the +2 POW from the Reagent of Strength, the Centurion could increase the POW by +12 and still make a single 1-ACT attack. This can be very useful, for example when the Centurion makes a critical hit or rolls very well on the damage roll. For example, the Centurion has taken the Reagent of Strength because he is battling the enemy Warlord. The Centurion scores a critical on his first attack, so we know that the Demarchon with ARM 8 will take at least 1 point of damage from the critical hit and the attack has a minimum strength of POW 3, +2 for the potion, so POW 5 vs. ARM 8. The Centurion could now add +10 to the POW of his attack roll and will be at POW 15 vs. ARM 8, which will already assure 7 points damage, +1 point for the crit. The Demarchon has 14 life-points, so if the damage roll on 2D6 is 6+, then the Demarchon will be dead. So in this case it would make good sense to use all remaining ACT for the damage because there is a very good chance the Demarchon will be killed with one blow. This sword is especially useful when facing high-ARM and also very high-DEF (16+) opponents (since you can spend the ACT to increase the POW after hitting your enemy). Against low-ARM opponents in most cases it makes more sense just to make 6 attacks instead. Imperial Heirloom – Bearer gains +1 strike rank, which means his attacks are resolved before the enemy with strike rank zero can counter-attack. In this way it is possible for the Centurion to kill enemies before they can counter-attack him. This is useful against rank-and-file troops who the Centurion might be able to kill with one attack. And it particularly works well with his Disarm ability, since models attacked by him have to pay one more ACT for their counter-attacks. BUT keep in mind that if the Centurion is charged, the initial charge attack does not cost more since the enemy already paid for it before he has been hit by the Centurion). Sword of Entropy – Makes the bearer immune to spells and MAG attacks. This is exceptionally useful when facing Halodynes, Troglodytes, Magistratum or Tuathan warbands. It also has POW 4 so hits harder than the previous three. Meteoric Spathe – Critical hits damage are resolved with 3D6 plus the regular crit damage, plus the POW 4 of this weapon. So he will likely be hitting with an average of 14 damage +1 for the crit. Crits are not uncommon, but not something you can really count on. Try to give him the Princeptor’s Campaign Veteran tactic and watch him slaughter even the toughest enemies. So we have some good weapons here; and they are all great in combination with the Reagent of Strength (+2 to damage roll) and the Imperial Blessing spell (+1 to damage roll). Combined with a charge or powerful fighting style, this becomes POW7 or POW8. Can also be combined with his Ancestral Pride tactic to give POW9. Anyway, with POW8 the centurion can kill regular troops (who have ARM7 and 5 life-points) with a damage roll of 4+. If we compare with other warlords, a basic POW of 4 is quite weak, and it looks important to buff his POW every turn. If we forget the potion and the spell, he can still count on Ancestral Pride and powerful fighting style in most cases, giving him POW 6. We can see that he really needs to work hard to cause good damage and this is something you need to consider in every round. Against High-ARM troops he will not be so successful without buffs, but against LOW-ARM troops he is a hurricane of death due to the fact that he can potentially make 6 attacks per turn! Scutum – The regular cheap item, providing +2 DEF and +1 ARM. Nice. This gives him DEF14 (normal for a warlord) and ARM 9 (pretty hard). Alchemite Scutum – Like the regular Scutum is gives +2 Def and +1 ARM. It also makes him immune to damage from AOE attacks and spells. A good bonus, and certainly useful against Shadow Trolls, Magistratum and Temple sub-factions! Reinforced Scutum – This is like the regular Scutum but reverses (+1 DEF & +2 ARM). This makes the Centurion DEF13 and ARM10, which is very, very hard. Most attacks against this ARM will cause little or no damage. Serrated Scutum – Allows a POW 1 damage roll once per standard activation, but only gives +1 DEF & +1 ARM. So this is an offensive option useful when facing low-level troopers. With the +3 stat points from the shields, the Centurion is starting to look a lot harder, plus he can take an armor item…. Titanium Liche Helm – Attacks against bearer cannot use their weapon abilities. Such abilities often include knockdown, direct damage or ignore shields. So this is especially useful when facing Troglodytes who have several units/models which ignore shields, because this neutralizes their ability, effectively retaining your shield bonuses. Enemy warlords often have nasty abilities like stealing life-points or reducing action tokens. Also protects against such things as Ambidextrous Fighter, Grapple-drag, Kick, pounce, Rending, Soul Drain, Lethal Range, etc. Ashplate Lorica – Non-enchanted attacks suffer -1 to hit and damage. That is a great benefit against most models in the game, it essentially increases the Centurion’s ARM & DEF by +1! Nice for stacking with other items and effects. Vambraces of Vantrium – Immune to direct damage. This is useful against critical hits, Fleshpounder Meaty Fist attacks, Banebrood Bubonic Plague, Longshadows MAG attacks, Banshee Soul Screech, Cromlech Guard Cleave attacks, Wycca Warriors Soul Harvest attacks, and several others plus many spells and warlord weapon abilities. Direct damage is quite common in Godslayer, so this is a pretty good item. Reinforced Segmentum – +1 ARM and immunity to critical hits. Critical hits happen regularly but not frequently; so as an added bonus to the +1 ARM this is a pretty handy item. Panacea – D6 healing potion. Reagent of Skill – +2 to MEL & MIS attack rolls for one round. Reagent of Strength – +2 to MEL & MIS damage rolls for one round. Cavrum Syrup – When a model dies it stays in the game with 1 life-point. Pretty handy, but being not dead with 1 life-point is not a great situation, and currently there is no Mortan healing spell to get healed up from this near death experience. So the Centurion really has a great selection of nice items, and with those it is possible to make some cool equipment combos. I like to organize them into packages ideal for certain roles. I like to organize equipment choices into a few logical packages, so here are four which were immediately obvious to me. • Legionnaires – the Centurion is the clear choice for a Legions sub-faction warband, especially one with lots of Legionnaires. This unit-warlord is a great combination which works flawlessly together, and so it always make sense to include at least one minimum unit of Legionnaires when taking a Centurion warlord. With his ability Centuria Commander the Centurion doubles his LEAD range for ordering tactics to friendly living models to 20 inches. Also consider that because of their sub-faction ability, Legionnaires will not need to test for receiving orders! Ancestral Pride is a great bonus for Legionnaires in melee since it gives the target model/unit either +1 on melee attack or +1 on melee damage rolls, even during counter-attacks! This is especially useful for boosting the low-POW of Legionnaires. • The Necromagus is a PERFECT support for the Centurion. He has two spells in particular which are exceptionally beneficial to your warlord. Transmortis allows you to take damage received by the Centurion and transfer it to another friendly model (for example a cheap Legio Mortum trooper). This can make the Centurion essentially immortal! Secondly he has the spell Imperial Blessing which gives +1 to damage rolls. These two spells, plus the Necromagus cost 35 points, and in a battle of 300+ points this is a very good investment. • Princeptor – This guy is generally useful as a roving solo killer. Especially since he is not heavy infantry. The Princeptor can give the tactic Campaign Veteran to the Warlord, increasing his chances of making a critical hit (and thereby increasing his damage capability). It costs 1 ACT to use, so keep it in mind as a possibility when the two models are within range to use this tactic. Here are a few strategies to try with the Centurion. This is useful for capturing objectives or for a legions sub-faction warband which is primarily designed for melee. This works best with a Centurion warlord, a Princeptor and a small unit of Carnifexors, ideally with units of Legionnaires 7-8 members strong. The “Moving Wall” is probably your best option when facing a faster and/or shooty opposing warband. In each round, assign your Legionnaires an action token from the Centurion. Move three times and then go into Testudo. When the enemy is close, check if the opponent’s units are in range of your Legionnaires using the Centurion’s tactic Coordinated Charge. This allows you to measure the distance. • If they are out completely out of your engaging range, but can still charge you, use plan C.
• If the enemy still cannot charge you and you cannot charge them, use plan-D.
A) Enemy within charge range: Buff the Legionnaires with an action token from the Centurion as well as the Centurion’s ordered tactic Ancestral Pride. Remember the Centurion has an effective LEAD range of 20 inches for issuing orders, and your Legionnaires never need to perform a test for receiving an ordered tactic because of their sub-faction ability. Ancestral Pride gives them a +1 either to hit or for damage. If the enemy which the Legionnaires will charge is likely to use a cool melee tactic like Phalanx, Shieldwall etc, then use the Centurion’s tactic Counteract, which will prevent any new tactics being performed. Now charge with the Legionnaires, performing Pilum Assault. Now they will be attacking with MEL 7 and POW3 from the charge bonus, with +1 to either one of those from Ancestral Pride. Generally it makes sense to put the +1 on to hit, so you will hit average DEF13 guys on a 5+ (83.29% probability of hitting). B) Engage the enemy: Move forward 3 times and engage the enemy, then activate Testudo. Works best if the enemy unit has already finished its activation and has no ACT left. Nevertheless, it can also be used against units which have not activated. Although you will not be able to counter-attack the enemy when they make their attacks (because you spent all of your action tokens and are in Testudo), you will have robbed them of their charge bonus and they will be facing your DEF15, ARM11 Legionnaires. If possible, place your Legionnaires so that only one or two are engaging the enemy (forcing the enemy to waste an ACT to move more troops into range before attacking you). Also, if you have the opportunity, engage other enemy models and units with the same unit of Legionnaires, preventing them from charging too. D) Move the all forward. Move forward and then activate Testudo. Same as above regarding Carnifexors / Molochs. The Centurion’s role in the above plans are crucial for the extra ACT he can give them and the tactic Ancestral Pride, not to mention their sub-faction ability. The Centurion is also ideal for a Mortan warband which will be facing fear and horror causing enemies. For example regular Legionnaires led by a Centurion have a Lead of 9, ensuring they will pass most LEAD tests. The same goes for facing models with the Reek rule. Once the Legionnaires get into melee through one of the above plans, use the Centurion to continue supporting them with Ancestral Pride and an assigned action token. His other 4 action tokens can be used on attacking the enemy himself with his 1-ACT attacks. While advancing with the Legionnaires, keep the Centurion just behind the unit and slightly off to one side. In this way, the Legionnaires will prevent the Centurion getting charged. This is a safe defensive plan for using the Centurion when leading a slow warband made up of Legionnaires. Facing low-ARM enemy troops like Bladeslingers, Mongrels, Reaver Tribesmen, Amazons, Kinswords, Gnolls etc? Throw your Centurion at the problem. Arm your Centurion with the Crimson Hurricane Outfit and be sure to take a Princeptor. Activate your Princeptor and order the Campaign Veteran tactic to the Centurion. Then use the Princeptor to engage the enemy unit and pin them (prevent them from charging). The Princeptor is NOT heavy infantry so he can move 12 inches. With Campaign Veteran, the Centurion can now roll an extra die on attack rolls to try to score a critical hit (rolls of doubles). With his Meteoric Spathe, he can roll an extra die of damage for critical hits. This can be a lethal combo (this is even better against warlords and elites!!). Once your Centurion is in a position to charge the enemy your Princeptor has engaged, activate your Centurion and drink down the Reagent of Strength, then charge. This potion gives +2 POW to the Centurion and he gets +1 POW for the charge bonus. Remember to put him in base-contact with the enemy models (but preferably not inside the MEL range of a lot of the enemy (in order to reduce the number of counter-attacks he will receive). He will now be making 5 attacks at POW 7, and good chances of scoring a critical hit which gives him 3D6 for damage rolls. If he kills the first enemy with his charge attack, then he will get slay movement and can thereby make up to 6 attacks this round! Remember the charge attack costs 2 ACT since he is not in base contact with the charged model when he pays for it. Against regular DEF13 enemies, he will be hitting on a 4+ with a POW of 7 and good chances for scoring killer critical damage. Now you can see why I call this the Crimson Hurricane strategy. Remember, if you wound but do not kill an enemy model, and it then counter-attacks you, it needs to pay an extra ACT after the first counter-attack (which is simultaneous) in order to do so because of the Centurion’s Disarm ability (except with the Imperial Heirloom). This is great for wasting enemy ACT of characters, creatures and warlords. This works best with 300+ points. Imperial Heirloom means your warlord will fight before almost all other enemies due to being strike-rank, so he has the possibility to kill enemies who charged him even before they can make their attacks. So he will effectively have DEF 14 and ARM 11. That’s solid. Firstly in your deployment, you need to place several war-machines with good lines of fire to cover most of the battlefield. You should take at least two because you want to force the enemy to come to you. Place them as far forward as you can, right up to the deployment line on the board. This will help to ensure you can actually hit the enemy. Place the Centurion in the front of a Legionnaires unit; they will prevent him being engaged by a lot of enemies. Deploy another unit or two of Carnifexors/Legionnaires and/or Princeptors along the front line. Fire with your war-machines and move your other models a few inches in front (but not blocking line of sight) to act as a defensive wall. This is not a subtle, ingenious strategy. You want to pile on the hurt with the war-machines, concentrating on wiping out units and causing bravery tests by killing more than 50% in on turn. The enemy models which survive to your side of the table will be facing a very solid defensive wall. Use the Centurion’s Counteract tactic on nearby enemy units to prevent them being buffed with tactics. After you absorb the enemy charge, you should have enough left to deliver a decisive blow to the enemy. If you are playing a scenario which requires you to capture areas or items on the board, you can still use this strategy but you just move the defensive line forward to contest the scenario goal. It is of course not as effective, but should still be workable. Facing Temple, Shadow Trolls or Tuathan warbands? Crucially this includes the Sword of Entropy which makes him immune to MAG attacks and spells. This means he will be immune to the strongest advantage of these warbands. The best way to take advantage of this is to put him in harm’s way and force the enemy to deal with him using MEL attacks. Make sure the Centurion is supported, but move him as fast as possible straight towards the heart of the enemy warband with decisive actions. The enemy will be forced to commit their best MEL troops against the Centurion, so he needs to activated in the same turn as one of your units and this unit needs to be positioned to cut off many lines of engagement. His outfit gives him a basic DEF of 14 and ARM 10 as well as immunity to critical hits effects and damage. This DEF will protect him well against rank and file, while ARM 10 is formidable. Elite units armed with 2-handed weapons are a danger (Wycca Warriors, Sons of War etc). The enemy will likely throw the best unit they have at your warlord, and will try to smash the unit guarding him. It would be tempting to send Praetorian Carnifexors as his support unit, but they will be pounded with spells and magical attacks, which they have no great resistance to. It makes more sense to use a big unit of plain old Legionnaires, or even better – Legio Mortum. Because Legio Mortum are non-living, they have some immunity to psychological spells which target living models. They are also cheap and expendable. Even better, they are immune to bravery tests, so will never flee, leaving your Centurion high and dry. Additionally, they are replaceable. This strategy calls for a unit of Legio Mortum, plus 2 spellcasters equipped with the Raise Legionnaire and Transmortis spells. With Raise Legionnaire, the Necrormagus can keep the bodyguard unit topped up with models. Casting Transmortis on the Centurion allows him to shift damage he receives on to the expendable Legio Mortum troopers, additionally, any Legio Mortum trooper who suffered less than 4 points damage that turn is automatically healed back to full life-points at the end of the round. So push your Centurion and guarding unit forward towards the heart of the enemy, and preferably the enemy warlord. Get him into melee and let him pile on the slaughter with Ancestral Pride and fighting style bonus to buff his POW up to 6, and the Reagent of Skill to make him MEL 10. With 5+ attacks at MEL 10 and POW 6, he will be a decisive factor in the result of the game. Hopefully the opponent sent elite, high-cost models to deal with your Centurion – all the better! With MEL10 he can hit even DEF14 guys on a 4+. Smash through the key unit, then advance on the warlord. With this strategy, you will probably command the game and have the opponent on the defensive the entire time. A unit of Carnifexors, a Moloch and a Princeptor complement this warband well, doing massive damage on the enemy warband while they are distracted by the Centurion and Legio Mortum. In this little plan, you focus on taking out high-points monsters and warlords, (then characters and elite units). Distract the enemy with serious threats like Carnifexors and Moloch. Use your Centurion together with a Princeptor who should be there to guard him and reduce the possibilities of your warlord getting charged. Maneuver the duo to engage the opposing creatures/Warlord. The +2 MEL means he will be MEL10. Most warlords have DEF14, so he will need only 4’s to hit most of them. Using fighting style, he will have a natural POW of 4. When you have scored a hit and rolled good damage, use the ability of the sword to increase the damage by spending extra ACT. Considering his attacks cost 1 ACT, and he will probably hit, you can likely get in 2 hits with boosted POW of 8. That will be enough to kill or cripple any warlord or creature. Using the Centurion to take down the high-points models with this combo, he should be able to earn double his own points value in kill-points, and that should be enough to tip the scales to a victory. This is an option not available to many warlords because they need to remain close to the core of their warband in order to issue ordered tactics. The Centurion has a LEAD range of 20 inches for ordering tactics, so he can work way off on a flank and still support his warband in the centre of the table. • Against high-ARM troops, he is not the best tool to use! Do not waste him that way. Use Carnifexors or Molochs or Scorpios to take down high-ARM elites and warlords. • If you must use him against high-ARM models then try to use Meteoric Spathe, Reagent of Strength and Campaign Veteran. 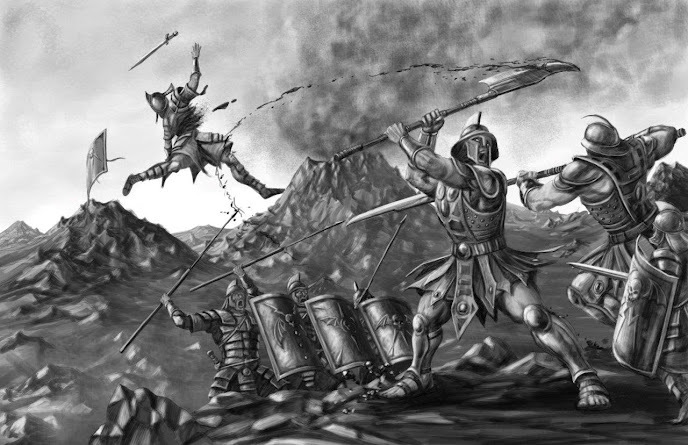 • The Centurion is not a good choice for leading an undead Magistratum warband because his sub-faction ability will not help them, and Ancestral Pride only works on living models. Plus of course he has no spells to buff the undead. The Technostratum is largely a missile-based sub-faction at this time, while the Centurion’s abilities and tactics are oriented for buffing MEL warbands, and so he is also not a good choice for leading a warband that is mostly Technostratum. Of course this does not mean you should never take other sub-faction units in a warband led by a Centurion. For example, a Moloch or Scorpio is a great addition to any Legions warband. • Always fight with your Centurion in base-to-base contact with the enemy, in order to benefit from his Close-Quarter Fighter ability. • Remember, he can also use coordinated charge tactic on himself to measure his own charges. • When in melee with high-DEF models like warlords, use his Ancestral Pride tactic on himself and any Legionnaires within range. It costs one ACT but because he can make 1-ACT attacks, using a tactic does not affect so dramatically how many attacks he can make compared to warlords who have 2ACT or 3ACT attacks. The Centurion was one of the last warlords we began testing since the basic rules were developed in 2008 using Halodynes and Nordgaard factions. Banebrood and Wyldfolk were tested next, while Mortans and Trogs were started last. Over time, the Centurion went through quite many changes, especially in his tactics. In his first incarnation back in August 2009, the Centurion had the tactics Disarm, Ancestral Pride, Coordinated Charge and Cohort Commander. He also had access to Pilum items and an artifact. He had a tactic similar to the Princeptor’s Riposte which allowed him to make a MEL attack roll when he was hit, and if successful, the damage of the hit was applied to the attacker. He also had a basic ARM of 10 and DEF15! Two months and 5 versions of play-testing later his ARM was reduced to 9 and DEF reduced to 12 since it made no sense that a heavily armored warlord should be so dexterous. The Pilum Assault ability was added and the artifact item had been removed. By Feb 2010, it was decided that Hardened Will would be a basic rule for all warlords, and so that was removed from the card, and the ability Battlefield Awareness was added. At this time during play-testing, the basic rules of Godslayer included arcs – meaning the front 180 degrees was the front arc and the rear 180 degrees was the back arc. Battlefield Awareness allowed him to change arc when he was charged. And by now his basic ARM was reduced to a realistic basic 8 and DEF 12. He also had a unit tactic called Feigned Retreat which allowed charged units to move backwards D3 inches. A good deal of time went by without further modification as we focused on other factions. Coming back to the Centurion 12 months later, we had removed arcs from the rules. They did give additional realism to the game, however, it slowed down play, caused discussions about which arc an enemy model was in, and also necessitated some really complex minor rules to regulate a few special situations. In the end we decided Godslayer was better without arcs and so the Battlefield Awareness was removed. Additionally, we saw that retreating was not really in character with Mortan legions, and so Feigned Retreat was removed. Clearly he needed some additional melee rule because he was rather plain for a combined melee-buffing warlord. Considering the benefits of using a short-sword we came up with the idea of Close-Quarter Fighter, giving him 1-ACT attacks when in base contact. It was realistic, fit perfectly and worked well. Pilum Assault had proven to be a little unbalanced and added even more items a player needed to chose. It also made him a glorified Legionnaire. We wanted to make him more focused on melee and so Pilum Assault was removed. Being still a little weak on the buffing side, we tried two new tactics – Counteract and Coordinated Charge. Both were situational but characterful and not overly powerful. We were now getting towards the end of the play-testing and we did not want to introduce any potentially over-powered tactics. After a little more play-testing the Centurion seemed balanced and a nice mix between melee and warband-supporter. The Centurion today is a very equal balance of melee warlord and buffer warlord. By comparison, I believe the Demarchon is rather 60% buffer and 40% melee. Due to his shield and armor options he can be made one of the toughest warlords in the game, and so the Mortan player can throw him into melee and not worry too much about losing him. In this sense he embodies exactly the original concept for the model which was a front-line warrior warlord leading from the front.